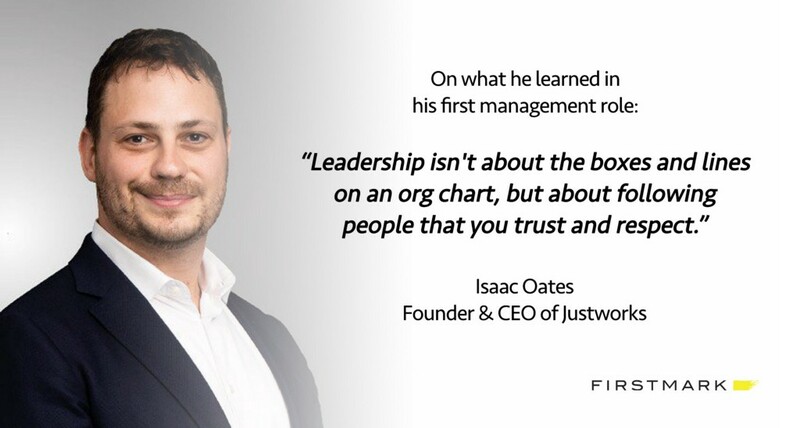 Isaac Oates is the Founder and CEO of Justworks, the fastest growing HR technology company that helps entrepreneurs and businesses grow with confidence by giving them access to big-company benefits, automated payroll, HR tools, and compliance support — all in one place. FirstMark is a proud investor in Justworks. Early in his career, Isaac worked concurrently at Amazon and in the United States Army as an intelligence officer—in both roles honing various aspects of his leadership approach. After Etsy acquired his first startup Adtuitive, Isaac led Etsy’s HR and payments group. He founded Justworks in 2012. We recently caught up with him to hear more about his growth as a leader, how he handles delegation as CEO, and much more. What was your first management role? What did you learn from it? I started my career as a software engineer at Amazon, where I worked on “third party payments” (3PP), the system that moved money between buyers and sellers on their marketplace. About three years in, I took on a project management role within the team. Even though no one reported to me on paper, I was in a position to lead the broader team to a successful outcome. That was the first time it really clicked that leadership isn’t about the boxes and lines on an org chart, but about following people that you trust and respect. Early in your career, before you assumed leadership roles, what was one quality you appreciated in a great manager? My first manager at Amazon, Phil Wilson, really cared about me as a person. I was 22, fresh out of school and had just started as an engineer on the payments team. Phil would talk with me about his own career experiences and help me think through the challenges I was facing. I think the big lesson was that he could lead by asking questions rather than telling you what to do. He was really good at letting you draw your own conclusions but also getting you where he wanted. This is something I wish I was better at. It requires a lot of patience. He was much more like a coach or older brother in the support he gave and we’re still in touch to this day. The big lesson was that he could lead by asking questions rather than telling you what to do. What are the most important daily or weekly habits that you’ve developed as a leader? Whether it’s on paper, on a spreadsheet, or in my inbox, sorting tasks into different groups and then attacking them together head-on has helped me be more productive. Recently, for example, I set up some filters in my email account that separate messages that demand a response from everything else. That might seem small, but it’s changes in habit like this that have helped me be much more responsive to the people I work with. It’s made a surprisingly large difference in our operating tempo. I also take time on Sundays to draft emails to send out on Monday morning. It helps me catch up on my inbox without also dumping work on my team over the weekend. What framework do you use for your one-on-one meetings? I like to review the goals that we’ve set together, discuss if any changes are appropriate, and then exchange feedback. I have 30 minutes per month with each of my direct reports, so most of our substantive discussion happens in group meetings rather than 1:1. That’s intentional — I think group meetings are helpful in building shared consciousness and minimizing politics. How do you handle delegation? What and when do you choose to delegate and how’d you become comfortable with it? I’ve been fortunate to hire and work with some extremely talented people at Justworks, who are much better at most things than I am. That makes it easy to delegate. That said, if I’m still getting comfortable with their work style or it’s a high-risk project then I ask to stay involved as it progresses. Some things I’ll always stay closely involved in, for example, activities that impact or send messages about our culture like promotions to leadership roles and company-wide events. If I’m still getting comfortable with their work style or it’s a high-risk project then I ask to stay involved as it progresses. 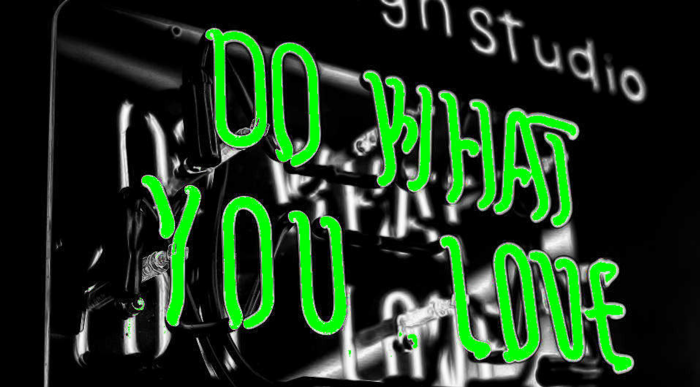 What advice would you give to a first-time manager about giving effective feedback? Giving effective feedback is difficult but it gets easier with time. I don’t have a specific framework, but I do acknowledge the person’s accomplishments and the effort they have put in. I also make it clear that my goal is to help them and the entire company perform better and that they should take the feedback in that vein, rather than criticism just for the sake of it. Giving feedback is probably the #1 management challenge for many people, including very senior and experienced leaders. Just keep working on it. What’s one unique hiring tip you’d share with a first-time manager? Start with the basics. Figure out where the person is from, what they’re about, what they value. Then ask yourself the right questions. Will this person strengthen your team? Do you think they have the potential to be promoted a few times? Do they have the curiosity to keep growing? Sometimes you get lucky and the right person falls in your lap, but usually, it takes a lot of nos to get to a yes. It’s worth taking the time. Check out our other Effective Leadership interviews with seasoned leaders from Box, Slack, Oscar, and Trello. Is there someone who you really admire as a leader (not at your current company) and would like to see us interview? Send their name and short description to jack@firstmarkcap.com. Justworks’ Isaac Oates on How To Delegate as CEO + More was originally published in Hacker Noon on Medium, where people are continuing the conversation by highlighting and responding to this story.